CNN published an article March 10, 2011 on a hearing problem called auditory neuropathy. At its essence, auditory neuropathy is when the inner ear is working fine, but the nerve going from the inner ear to the brain is impaired. The hallmark of auditory neuropathy is a negligible or very abnormal ABR (auditory brainstem response) reading together with a normal OAE (otoacoustic emission) reading. A normal OAE reading is a sign that the outer hair cells are working normally. 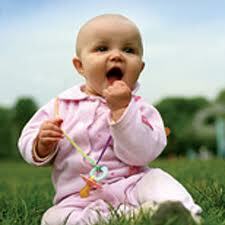 When a child is first born, all undergo a hearing test using either OAE or ABR testing. Let's assume the newborn has auditory neuropathy and a newborn ABR testing is done. The hearing test will come back that the child failed and will be referred for further testing. If additional testing was done with ABR only (and not OAE), the child will be considered to have hearing loss and hearing aids will be recommended. If OAE is done, the newborn with auditory neuropathy will pass the test and no referral will be made. Really... the take-home message here is to ensure that if ABR was done and a newborn fails, additional testing that is performed must include OAE. Keep in mind that people affected by auditory neuropathy may still have hearing loss and though they may be able to hear sounds, they may still have difficulty recognizing spoken words. Sounds may fade in and out for these individuals and seem out of sync. Watch how ABR is performed in our office in the video below. We also do OAE testing.